Agent response slow? Tired of waiting to interact with agents? 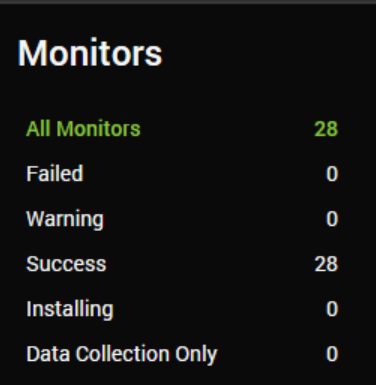 Offline Server alerts flaky? Your heartbeat may be broken! If your Heartbeat is working properly, this should update every five seconds. This check-in is actually sent from the LabTech Monitoring Watchdog Service (the second Automate service). If you find only one or two machines are having an issue, look at this service on the affected agents. 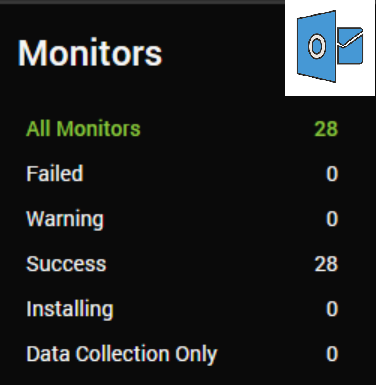 Your offline server monitors are potentially delayed, not as accurate and can trigger erroneously. By default the offline server monitor takes into account both the last full check-in and the last heartbeat sent in. When you open an agent window, a special process occurs within Automate that sets a flag so that in the next Heartbeat check-in, Automate gives a response to the remote agent that says “I want you to properly check in, we have stuff for you to do!” The agent then immediately does a full-check in, and the response from that tells your remote agents to enter a mode called FasTalk. Once this is on, the remote agent does a full check-in every five seconds. When this is not working it is a significant impact on your engineers who are working. No-one wants to interact with a tool that takes five minutes to respond to whatever you tell it to do. Fortunately there are some simple steps to identify whether this is working or not, and how to fix it if it is not. 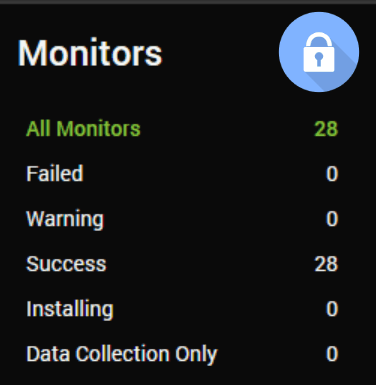 How can I tell if this is broken or not enabled? You should then notice that in the bottom right hand corner, the countdown (which was likely anywhere from 0 to 5 minutes) jump down to a repeating value of 5 seconds (this means your machine is checking in every 5 seconds and ready for your commands and will process them in a maximum time of 5 seconds). If your system is already doing that when you open agents, the rest of this does not apply to you – your heartbeat is enabled, and working properly. Mine does not do that! What is this wizardry? Now we need to do some troubleshooting! This is either going to be one of three things, either Heartbeat is turned off in the configuration, there is a firewall rule wrong somewhere and the port is not open or the URL for your redirector config is wrong or potentially all three of them. Using SQL to find out if Heartbeat is working. Run the above on your Automate server. This pulls results from the Heartbeat table (where last heartbeat sent for each computer is stored) and the computers table. The results you get back count the number of recent heartbeats and the number of full computer check-ins. If you have 1500 agents that are online, I would expect both numbers to be relatively similar around 1500 (small variation is not an issue). If your Heartbeat count is 0 or significantly lower than your number of computer check-ins then you have a Heartbeat problem that is likely network related. On a Remote agent (nothing on the same physical network your Automate server is on), browse to C:\Windows\LTSVC\LTSVCMon.txt – Heartbeat errors are logged in there. Heartbeat has to be turned on for this to work too! Go to System > Configuration > Dashboard, and open the Config then System Tab. In the “Redirector Config” section ensure your Hostname is not “Localhost”, it should be the URL of your automate server, IE: automate.joebloggs.com. Leave Port and Passcode. That’s it – if you’ve done all the above and it’s still not working come speak to us in the LabTechGeek Slack, and ping me (@gavsto). Hope this has been helpful! Last step, the service that actually receives the Heartbeat packets is the LTRedirector service on your automate server – make sure it is started! The “Last Contact” time stamp shown in the Agent tile is for the last full check in not for a heartbeat. The heartbeat timestamp is shown by hovering over the heartbeat icon in the bottom/status line of the computer window…just note it does not update in real time. re: FasTalk being an indicator of the heartbeat, that’s not 100% accurate. 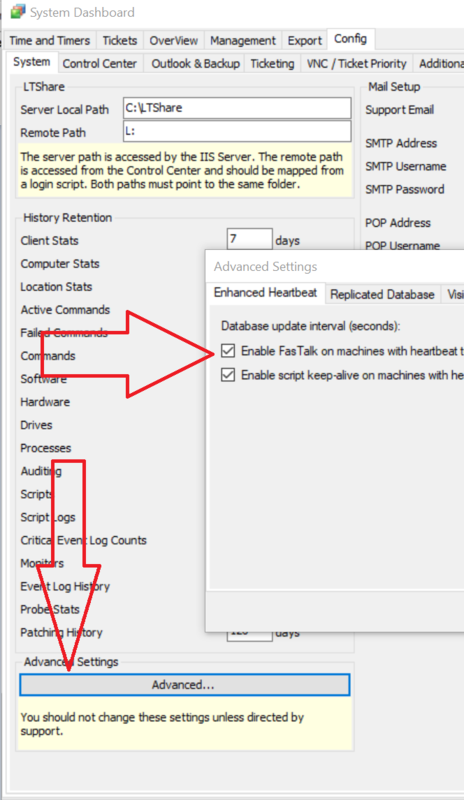 In Dashboard/Config/System/Advanced (Settings) there is an option to “enable FasTalk on machines with heartbeat turned on” which I think is unchecked by default? So PCs with heartbeats don’t flip to FasTalk automatically, since there is no need….commands will be picked up by the heartbeat (or more accurately I think the heartbeat tells the agent to check in right away). (The other option for enabling script keep-alive I believe is checked by default). Thanks Steve – updated the screenshot for the heartbeat indication. Bit of a cheeky brain fart there. For the FasTalk, I am more saying that it wouldn’t immediately kick in (FasTalk) if Heartbeat wasn’t working properly. I say this thinking that it was actually enabled by default though I’ll have to find out what the default is!